The Wheel of Fortune card is a major arcana card in the Rider-Waite-Smith tarot and other decks based on the Latin Tarot or Tarot de Marseilles. When it appears in a tarot spread, you can discover its meaning through the symbolism that appears in the images on the card. The Wheel of Fortune is one of two major arcana cards that doesn't focus on a human as its central figure (the other is the Moon). Instead, the central image is a wheel with strange markings. 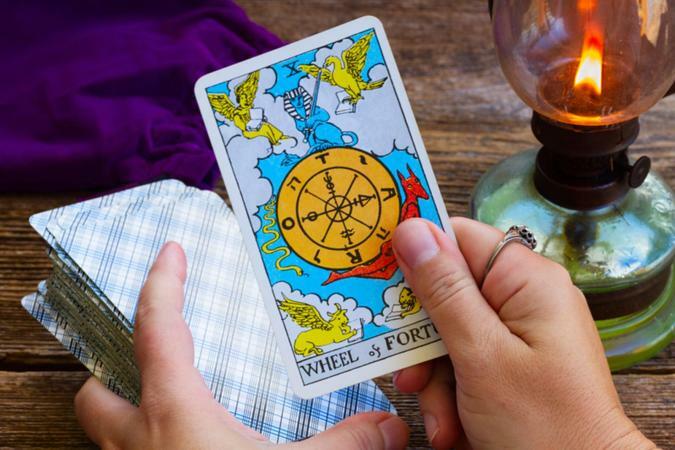 The wheel is inscribed with the letters to spell rota (Latin for wheel) or tora (Torah without the "h," as is also found on the High Priestess major arcana card). This represents spiritual truth and wisdom that is both seen and hidden. There are four alchemical symbols inscribed on the wheel. The alchemical symbols are the four ingredients said to be required to create the Philosopher's Stone, which can turn lead into gold or base metals into precious metals. There are also four Hebrew letters inscribed on the wheel: Y, H, V, H, which is the name of Yahweh (the name for God in the Jewish faith). Around the wheel in the card's four corners sit four winged creatures all reading books: an angel, a phoenix, a winged lion, and a winged bull. These are representations of the four classical elements (earth, water, fire, air) or the four apostles who wrote the Gospels, Matthew, Mark, Luke, and John. These symbols also appear on the final card of the major arcana, the World (XXI). A sphinx sits perched on the top of the wheel. You will also find the sphinx in the major arcana card the Chariot (VII), and it represents the coming together of disparate cultures or peoples, as well as balance and diversity. The god Anubis flies below the wheel, holding it on his back. Anubis is the Egyptian god of the afterlife in charge of embalming the dead. To the right of the wheel, a serpent slithers downward. The serpent is also represented on the major arcana card the Lovers (VI), and it represents temptation and knowledge. The Wheel of Fortune is the number X (ten). In numerology, 10 is associated with destiny. It can also be reduced to the single digit 1 (10=1+0=1), which is a return to the beginning, oneness, wholeness, and creative potential. In a tarot spread, the Wheel of Fortune represents pure possibility and the raw materials for creation. All the symbols show a balance of the elements necessary to create, spinning base metals into precious metals or building something new from raw elements. With so much potential in the symbols of this card, the Wheel of Fortune portends of significant unexpected change - usually positive - and the possibility of chance encounters or occurrences that can change your life for the better. The elements on the card also invite you to seek wise council from higher sources, such as your higher self, intuition, or spiritual learnings as you allow for and integrate the changes into your life. Reversed, the Wheel of Fortune portends of upcoming bad luck, or it may signify the ending of a period tumult. It may also indicate closure of some aspect of a relationship or in work or home life. The Wheel of Fortune shows you the element of chance may come into play in your life. And while it may seem as if certain things come about purely as a result of happenstance, the Wheel of Fortune reminds you many forces have come into play to cause what seems like a chance occurrence but is really the result of the careful arrangement of many forces in your life.